This SS Ayrfield ship has a very interesting story. During World War II, she carried US troops to the sites of fighting. In the 1970s she was sent on a ship graveyard near the Olympic Village in Sydney. By 2000, with the Olympic Games coming up, the war veteran ship has been turned into an adorable forest island that tourists love to visit. Only 10 nautical miles from the Öland island, in the very depths of the Baltic Sea, lies the world’s largest XVI century ship named ’Mars,’ that usd to carry 107 guns. 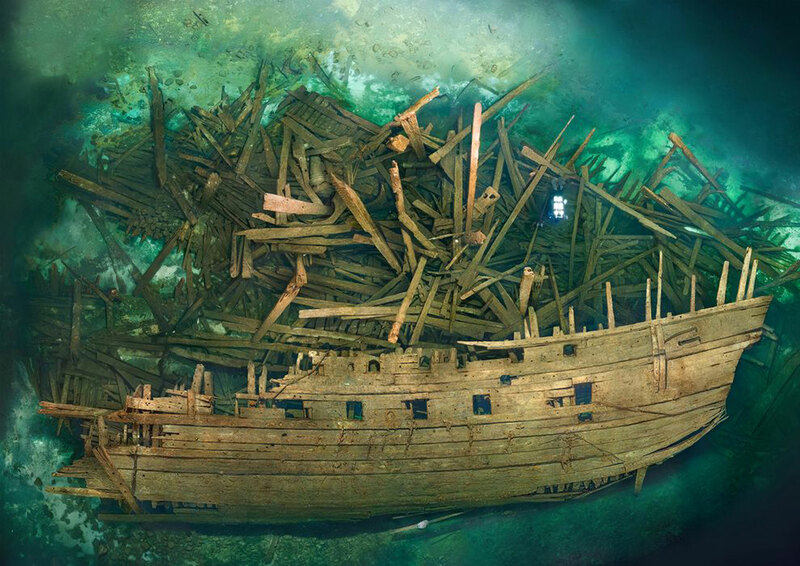 The ship sank on March 31, 1564, as it has been attacked by three enemy ships, and has been searched for since the 1960s. The tiny islands of the Chatham archipelago have been inhabited by just 600 people. Life on the islands has not changed much since the XVIII century when this place was discovered. Fishing is still the main trade here, while the greatest attraction is this ghost ship that used to serve the fishermen and still looks like she’s rushing through the waves. This Brazilian yacht has shipwrecked in the Ardley Bay and now looks like eerie ghost ship. Brazilians were shooting a documentary but strong winds and a raging sea forced them to abandon the ship. Ever since then this yacht rests underwater. Built and launched in 1902 in Wilmington this yacht was called Circle Line V and was designed for patrolling the coastal waters of the Atlantic Ocean. The yacht was changing owners several times during the next 80 years. In 1984, the ship was abandoned in the Ohio River, close to Lourensburg. To this day, no one understands why and how she ended here. This wooden barge ran aground in 1929. It still remains there as a monument to her own tragic death. Hospital ship how it looks now. During World War I, the ocean liner SS Maheno served as a military hospital. In 1935, when she was being towed to Japan, she suddenly disappeared to be found several days later. As it turned out, The ship was thrown to the shore of a deserted island by a violent storm. Thus, she ended near Australia. The crew lived in tents for three days, waiting to be rescued. The ship was left there to live out her days in solitude. This fishing boat has been part of British landscape since the dawn of time, listening to the wind through the cracks of her busted deck. Many boats are being sent to the famous ship graveyard situated at the Mallow Bay every year. They resemble a ghost fleet that keeps going somewhere through the ground, slowly disappearing under the water. This ship was at the port of Gytheio in Greece when the wind changed suddenly and she was thrown back out into the open sea by a storm. The sailors managed to stop her movement temporarily, but the anchor didn’t hold. The ship started rushing through the waves again until she ran aground. Today ’The Flying Dutchman’ is resting peacefully in the shallows. The Bermuda Triangle has a clouded reputation we all know about. The local ship graveyard further adds to the mysteriously melancholic atmosphere. Romantic-looking, this icebound sailboat became a local landmark, often visited by the tourists. SS American Star used to transport supplies and soldiers during the World War II. After the war she became a popular cruise ship. In the 1980s, they wanted to turn her into a floating prison, and then into a hotel. Due to a heavy storm, she ran aground and was left to live out her last years near the Canary Islands. The Saba tugboat, now grounded on coral reefs, is one of the main tourist attractions in Curaçao. The ship found her second life underwater as she became a home for countless fish and got covered in beautiful corals. Today the ship is a real hit with the divers. If the world of sunken ships, Titanic is the ruler. The ship been called unsinkable, grandiose, and luxurious. This Is Where The Grand Staircase Used To Be. Yet she tragically collided with an iceberg on her maiden voyage in 1912. This horrible accident claimed the lives of thousand passengers. Since then silent and dark, Titanic has been resting 2.4 miles below the surface of the ocean for decades, slowly rotting away. In 1985 did people risk their lives to disturb the giant, and 10 years later the director James Cameron went down to her several times to do research for his famous movie. This passenger boat now looks like a terrifying ghost ship, ran aground in 1954. The Point Reyes is an abandoned fishing boat located in the San Francisco national park of the same name. She has been here alone for a few decades now. This huge cargo ship lies at the bottom of the Red Sea. It ran into a reef and sank ages ago, creating one of the most famous diving sites today. The second one is another abandoned fishing boat, just one of the hundreds in this area.